The history of the brats started about 10-15 years ago when a good friend of John Jones’, who lived outside of Jacksonville, had asked him to make him some sausage, something different. John Jones started playing around with different recipes just for fun, and the first recipe he concocted was a curry wurst. Eventually he came up with their famous apple brats. People would come in and buy these famous brats – and from that the brat business started to grow. The store has been featured in The State Journal Register, the Illinois Times, and most recently on a PBS special with Mark McDonald. Besides owning and operating the business, John and his wife, Beth, are also the parents of 6 children and grandparents to 6 grandchildren. Their son, Dan Jones, is the one you will more than likely see at a farmer’s market or any other event promoting the business. Dan Jones has been in the sales business for 10 years. He sold anything from advertising to furniture, but this type of sales was different. He had to figure out ways to get the brats known, and do that in a way that the law allowed, so he took the idea of a good friend who suggested taking them to farmer’s markets. Before, meat products couldn’t be sold at farmer’s markets because there wasn’t a way of keeping the products cold, but now because of technology and new laws, he’s able to go to farmer’s markets. Most often than not, you will find him at the Springfield Farmer’s Markets. Dan Jones started going to the markets around 2010, and at the time they only had 8-10 kinds of brats available. As of Labor Day weekend this year, they had up to 51 different varieties. The famous brats can also be found at Obed and Isaac’s, a microbrewery and eatery in Springfield. Obed and Isaac’s is also a family owned business. The brats made their way to Obed and Isaac’s menu after a guy had been to the eatery and ordered bangers. The guy took a bite, said they were ok, but they sure didn’t beat the Jones Boys Market bangers (a term for sausages in England). After that, the owner visited the market and said he was told they had really good sausages. After the owners tried the products, they immediately wanted to start serving the products on their menu. So from there, the owners asked about purchasing some of their products for the eatery. Currently you can find Jones Boys Market bangers and also beer brats on their menu. Dan Jones calls his dad the mastermind behind the brats. “I’m more of the laborer. I get the meats ready at night and then into the freezer, so when the girls, Heather and Valerie, come in the morning, they can get the meats out and do the packaging,” said Dan Jones. During the summer as you can imagine, is when business really picks up. Most nights during the summer, Dan Jones is at the store from about 9:30 pm to 4 am preparing the meat, so it has time to sit overnight before the girls package it when they get there in the morning. This past summer, the months of May and June beat out July sales, whereas usually July is one of the busiest months. But due to the mild weather we had, it was different this year! Customers come from all over the United States just to try these famous brats. 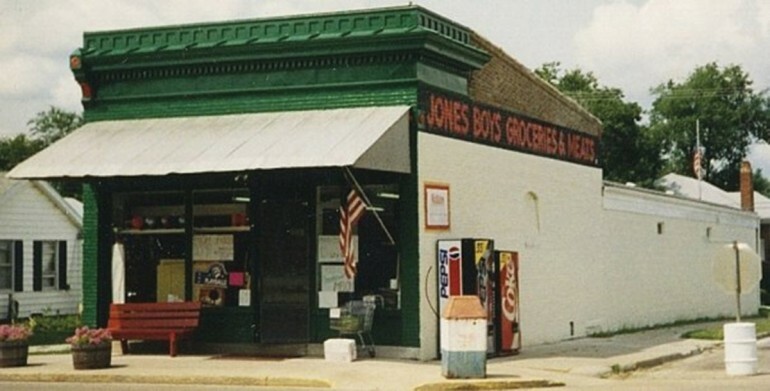 Ashland is a small town that most people don’t normally hear about, but the Jones Boys Market has definitely changed that. If you are ever around that area, make sure to stop in and say hello! And maybe also try some of their brats!